New signs give bus riders some timely tips – Miami Herald with a photo by me! I’m in Indianapolis today through Sunday for the SPJ Scripps Leadership Institute. A dozen of us who arrived before noon met up and went out to lunch at a local Buca di Beppo Italian restaurant. Yums. Because of the nature of the “conference” (it’s not really a conference) I don’t plan to liveblog, but I may post thoughts in the evenings. About 50 student and professional members are gathered here to learn about SPJ, how to improve our chapters and play duckpin bowling, so it should be a good weekend. I’ve already met some cool people and I look forward to getting acquainted with everyone else as the conference begins. 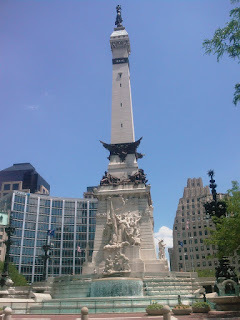 And check out this photo I snapped of Monument Circle in Indianapolis with my smartphone camera. Posted on June 6, 2008 Categories UncategorizedTags Conference, Education, Journalism, miami herald, news, social networking, spj2 Comments on Greetings from Indianapolis! Tuesday marked the beginning of my summer internship at The Miami Herald. I began by driving to the main office in downtown Miami for the usual first-day procedures before heading back to Broward, where I’d be working as a local general assignment reporter based out of the Herald’s Pines office. For local residents: Look out for the article in print as well. UPDATE: The story appeared below the fold on 1B Wednesday morning. Job/internship panel to be livestreamed today at 12:30 p.m.
I’ll be moderating a panel today that will discuss what students need to know and do to prepare for journalism jobs and internships. My money is on mindset and skillset, in addition to the fundamentals. The event will begin at 12: 30 p.m. in Studio A of the School of Communication and is hosted by the UM student chapter of the Society of Professional Journalists (and organized by me!). The first part of the event will be a Q & A session with the panelists, each of which does recruiting work for his/her respective organization. After that, they will meet individually with students to provide personalized feedback, critique resumes, etc. After watching the livecast of a video strategy session (The Northern Short Course in Photojournalism) on ustream.tv, which Howard Owens teased on his blog, I thought it would be good to do the same with our session using that service. And yesterday I saw Kyle Hansen’s post LIVE Video! announcing that The Spartan Daily at San Jose (Calif.) State would be using ustream as well to broadcast a session Monday with the university president: The live video worked! I had originally thought to do our livestream through the School of Comm‘s Web channel, but they don’t have a player that I could use to embed the video. You may recall that this event was originally scheduled to take place during this year’s Communication Week on Feb. 19. Unfortunately, we had to cancel because Fidel Castro decided to announcement that he was stepping down as president of Cuba that day. Ask a question: Feel free to comment on this post or use the video player’s built-in chat feature to submit a question, which requires registering with ustream. Full disclosure: I interned at the Sentinel last summer and will be at The Herald this summer. Posted on March 17, 2008 Categories UncategorizedTags ap, Journalism, miami herald, spj, sun-sentinel, video, webLeave a comment on Job/internship panel to be livestreamed today at 12:30 p.m.